There is lots to see and do on a Canal Boat Club holiday. Travel the canals at a leisurely pace and enjoy stunning and varied scenery. The following information should give you a useful guide of what to expect on your canal boat holiday. The Utility fee for a 4 berth boat is currently £47.50 per holiday or part thereof. The Utility fee for a 6 berth boat is currently £60.00 per holiday or part thereof. A fuel deposit is payable on arrival - this fee is currently £90.00 per week or part thereof. Guests pay for the fuel they have used, but will not normally have to re-fill if doing 10 or less days cruising. A Security and Damage deposit of £500.00 is payable on arrival. This is taken as a credit card swipe and is refundable subject to the boat being returned clean, in good order and on time. Alternatively an optional and highly recommended damage waiver of £50.00 is offered which negates the need for the security deposit. This does not cover negligence. A total of 2 dog(s) are permitted at a cost of £30.00 each. This Non refundable waiver will protect your 'Security and Damage' deposit unless there is evidence of negligence. Payment is by credit card/debit card only. Guests MUST contact the office at least 24 hours in advance to confirm their time of arrival and number of guests in party. The office closes at 5.00pm March to October and 4.00pm November to February. Cruising is subject to guests accepting the compulsory tuition, which is only available on check-in days. In exceptional circumstances you may not be able to cruise if the Marina staff are not confident in your ability to use the Narrowboat, or if you have young children who need to be supervised and there is not a minimum of 3 adults. For your safety, you and your crew MUST watch the Canal & River Trust DVD. This can be viewed online by going to http://www.video-server.co.uk/boaters-video.php. If you are unable to view this online please contact us and we can post you a DVD. 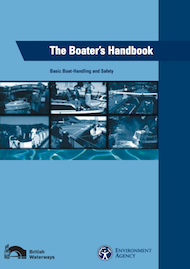 It covers boating etiquette and the safe operation of bridges and locks. You can also read a copy of the Boaters Handbook which can be found on the above link http://www.video-server.co.uk/boaters-video.php. Alternatively if you would like a hard copy please contact the office. Further links of interest for you are www.canalrivertrust.org.uk about boating or go to www.considerateboater.com which is for people new to boating. Canal maps and other information can be purchased online in advance from the following website : https://ukcanalboating.com/maps-and-guides.html If you prefer, you can buy maps at the marina when you arrive. (subject to stock). http://www.canalrivertrust.org.uk is also a useful website to view and plan cruising routes. Parking is available for one car per booking. Additional parking spaces may be available, but are not guaranteed and may be subject to a charge. Guests are advised to take wet weather clothing. Every week on changeover day, our dedicated and knowledgeable staff confront the whole myriad of emotions and states of mind amongst our guests. Fear, trepidation, excitement, amusement, confidence, arrogance, happiness - you name it, we've just about seen it all. Our role is to make sure that you get the very best out of your cruising period and we will do all in our power to pass on, as far as we can, our advice, knowledge and experience during the tuition period. We will do this to the best of our ability in order that you will derive as much as possible from your visit to us. Therefore we ask for your full cooperation and commitment and an acceptance that all that we pass onto you is done for the benefit of yourselves and all of those around you. Your health and safety is paramount and without a proper framework of knowledge at the beginning of the experience, your enjoyment could be seriously compromised. We want to be sure that you get the most out of your valuable and hard earned holiday time. Everybody should be aware that the speed limit on the canals is4mph but that the recommended 2 - 3 mph is the optimum pace during normal cruising. You should also slow right down when passing other boats and fishermen. Most of us know the reasons why. Essentially, it is downright inconsiderate to other boaters. However, excessive speed also creates wash which can also permanently damage the canal bank and those creatures who live on it. Please - slow down. You are on holiday to relax and escape from the stress of modern living - take it easy and we will all derive the benefits. The Company takes its responsibilities very seriously indeed in terms of its commitment to guests as well as other users of the canals,including the flora and fauna. Each of our craft is fully licenced with the Canals and Rivers Trust for the canals and rivers under it's jurisdiction . The boat is insured and has a regulatory Boat Safety Certificate and Gas certificate. After check - in, you will be given familiarisation training which includes our own specially commissioned video. This introduces you to the narrowboat and takes you through how it all works. It also introduces the rules of cruising together with what is and what is not acceptable within the cruising etiquette. You can take notes and raise any questions with your allocated boatman/trainer. The televisual part lasts up to an hour and this will be followed by practical training complementing the video presentations. For your comfort and safety, the videos remain on board throughout your holiday which together with the extensive boat manual gives you two excellent tools for reference. It is crucial to follow the established procedures which are in place for the safety and comfort of guests. Lifejackets are available for all of you, though we find most of you over the age of 16 years decline. However, they are available and we insist that children aged 16 years or under use them at all times when outside the boat cabins. The Company will not allow any boat to leave its Marina mooring if there are children on board without lifejackets. In addition, the Company will not accept responsibility where lifejackets have not been worn. Please note that the Company reserves the right at all times to limit or rescind the right to cruise subject to the safety considerations of guests and craft. a) Do not bring too much luggage. Cases are not a good idea as storage on a narrow boat is limited. Folding, collapsible bags are best. b) Do not bring your best clothes. Be practical and remember to bring something warm and something waterproof. This is England and whilst we do not suffer monsoons, it can (and does) rain at a moments notice. c) Change down and try and get into your lowest gear - slow down and relax, you are on holiday, not taking part in a race. d) Always consider your fellow boaters and others using the canal and its environs - this includes the wildlife. e) Do not cruise the narrow boat whilst under the influence of alcohol. This is a dangerous practice and there are more and more cases of boaters being breathalysed by the police. f) If you bring bicycles, you may do so entirely at your own risk. In addition, you must supply sufficient matting to protect the roof of the boat from damage. g) Note that walking or sitting on the roof of the boat whilst it is in motion is extremely dangerous. It is easy not to notice the arch of a bridge! h) When outside the cabin, children under sixteen years old should wear lifejackets at all times. These will be provided at reception. A refundable deposit is levied. Lifejackets are also available for other age groups. i) If anybody should fall in the canal - turn off the engine at once. j) Always take out personal insurance to cover the duration of your holiday - even if you are arriving from the UK. Many Brits do forget! Don't let it happen to you. k) Avoid bringing the laptop! l) Follow the simple daily service schedule. m) Remember, if you are out of the marina, cruise at least five hours a day to keep the power system charged and try not to burn power unnecessarily. It is pretty inconvenient if the lights go out!.